My final 24 hours driving the Lake Erie shoreline couldn’t have been any better. From top to bottom, it was extraordinary; with new sights and constant surprises that leave me very much wanting to go back. 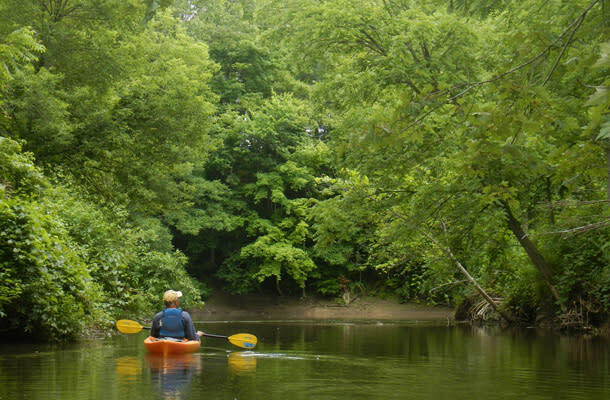 I started the final stretch of my road trip with a kayak adventure on Big Creek with Long Point Eco-Adventures. 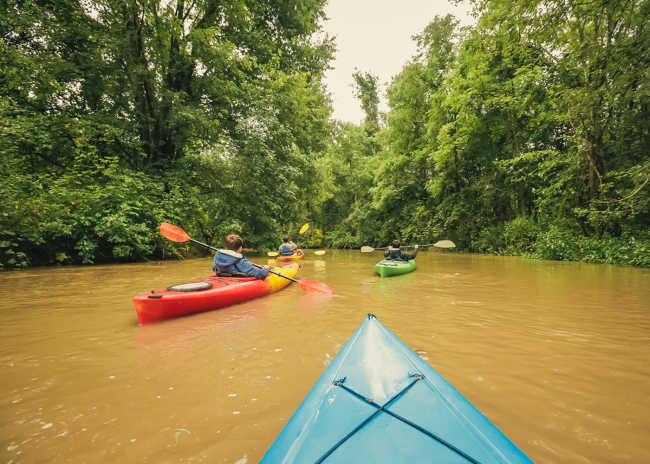 After a demonstration of how a fishing kayak works (very cool looking if you ever get a chance), I head out along the creek with guide Brian Craig. He’s a terrific guy who’s very knowledgeable about the flora and fauna. He points out exotic trees not usually found this far north, including Kentucky Coffee Trees, and talks about the amazing diversity in this section of Carolinian forest. Its diversity is why folks call it the Canadian Amazon. I don’t see any piranhas, but the slow-moving current is intoxicating as we drift past fallen trees and watch black and blue-winged damsel flies dance on the water. Craig talks about how folks are keen to protect the creek and its natural life. He shakes his head at the environmental impact. But he knows people are wiser these days and are intent on saving the region. We snack on locally made strawberry pastries made from Norfolk County berries and eat other ones straight out of a Tupperware container he’s brought along. They’re absolutely bursting with flavour. Craig says this part of Ontario is one of the richest growing areas in Canada, with everything from hops to hazelnuts being grown. When I’m driving around later in the day, I see signs pointing out locally made potatoes, peaches, corn, berries and other naturals, as well as ginseng and even Caribbean callaloo. My next stop with my tour guide from Norfolk County is Burning Kiln Winery. I have no idea what to expect when we walk in, but we immediately start talking with the servers/wine experts behind the counter. I tell one of them how much I enjoyed the Colaneri Winery in Niagara when I was there in spring. A few minutes later I’m chatting with Andrzej (Andre) Lipinski, one of Ontario’s top winemakers. He uses the same Italian method of drying grapes in the air after they’re picked and before they’re crushed, as he does at Colaneri, a style borrowed from northern Italy. It’s said to add extra flavour to the wines, and there’s no doubt the Burning Kiln varieties have aroma and depth and fruit to spare. I adore the Cab Frank and love the “Strip Room” red, named for one of the former tobacco buildings in the area. I also admire the rose and some of the whites, of which I tried far too many than a person should at one time without spitting. Lipinski also makes wines at Big Head, a winery in Niagara I didn’t get a chance to try out on this trip. Lipinski tells me the sandy soils that made tobacco a good thing in this area (you can find old photos of tobacco growing businesses on the walls at Burning Kiln) also make it good for wine. “The soil here means more aromatic wines but less structure,” he says. They extend the growing season, in effect, by air drying the grapes after they’re picked. The result is a riper, more full-bodied wine that appeals to a new world wine lover like me. It’s amazing that Lipinski has come this far. He was an automobile mechanic in Poland before coming to Canada in 1989, where he worked on a farm and later got a job at a winery. He didn’t even like wine but told himself he had to learn. So he did. He went on to become an assistant wine maker at Vineland Estates in Niagara and started picking up hugely important awards in Europe and other spots. He’s now considered one of the top winemakers in Canada. Across the street from the winery you’ll find Long Point Eco-Adventures, with ziplines and suspended bridges and “glamping” tents that give folks a taste of camping with indoor plumbing and comfortable beds inside a canvas structure. Folks who stay the night can get a free lift over to the winery in a golf cart if they want to taste some of Lipinski’s magic, and how good is that? They have fluffy robes in the tents, and breakfast consists of local bacon and bread and free range eggs and other treats. There’s even Wi-Fi and front porches with Muskoka Chairs. From there we make a dash up to Jensen Cheese in Simcoe, a family success story since the 1950s and a hugely popular foodie spot in Norfolk County. They make their own Cheddar, Colby and other cheeses and also cut and pack exotic imports from around the world such as Asiago and Manchego. You’lll find jams and cheeseboards and all sorts of good stuff, as well as fabulous, rich cheese. Just up the road is The Blue Elephant Craft Brewhouse, a great brewpub where they make traditional beers but also a few edgy varieties, including a lager with strawberry. It’s a cool, old house in downtown Simcoe that specializes in Thai food; a perfect match for their beer. They also have a couple of fine patios that are perfect for summer or fall. I don’t have much time in Port Dover, I’m sad to say. But it feels like a lot of the California beach towns I used to hang around when I was kid growing up there. At Callahan’s Beach Bar they’ve gone so far as to plant a series of palm trees in the sand, giving the place a Florida-California touch that’s truly unique. 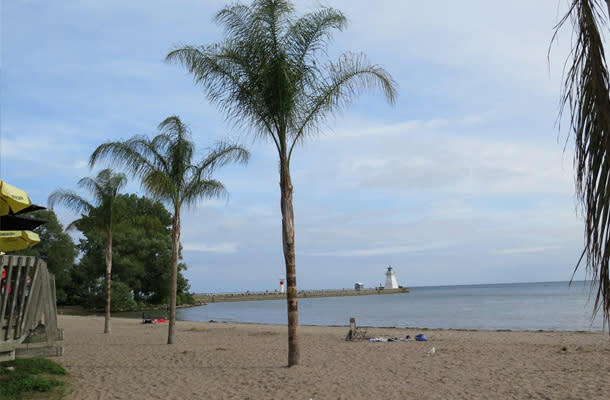 There’s also a nice port for watching sail boats or fishing boats heading to the lake and a cool lighthouse at the end of the pier. There are funky beach shops selling brightly coloured inner tubes and beach towels and some lovely shops selling home décor goods and sandals. I’m told there’s part of an old jail under the Norfolk Tavern, where prisoners were kept in the War of 1812. They were mostly American officers, not run-of-the-mill enlisted men. The story goes that they were given good accommodations and plenty of beer to drink during their days of captivity. And women to spend time with it, as it were. They had it so good that some refused to go back to the States after the war was over and instead settled in Canada. At least that’s what I was told. And I love a good story so I’ll go with that. I drive from there to Cayuga for a dinner at Twisted Lemon. It’s an old home that’s been turned into a glorious restaurant with dark wood but lots of colour. Chef Dan Megna serves up lemon pepper bread twists that are beyond addictive. I want to stuff some in my pocket to have at home but figure I might get caught so avoid the temptation. I sip a lovely drink with bourbon, lemon, vanilla simple syrup and two kinds of bitters. For dinner, I try the sweet corn chowder with bacon and a lobster taco appetizer. My main course are a pair of magnificent short ribs the size of a Smart Car, with a garlic, malt and raspberry glaze. Twisted Lemon is a wonderful restaurant in Cayuga. The motorcycle out front belongs to chef Dan Megna. I have no room for dessert but I’m told the vanilla crème brulee is a killer. The menu says the chocolate pate is what would happen if chocolate mousse met fudge and had a baby. Megna uses local ingredients as much as he can but also figures he doesn’t want to cheat people on taste by skipping great ingredients from further away. “You don’t need a road map to eat it but it’s visually exciting,” he tells me. That night I bed down at The Lalor Estate Inn in Dunnville, which I absolutely love. I have a large room with a sun room and a large bath in a gorgeous old home. Co-owner Judy Brough says Oscar-winning (twice) actress Hilary Swank stayed here a few years ago when she was making the movie Amelia . Brough thought she might be there to complain. Instead, Swank said the room was too big for her and that one of her assistants was travelling with her husband and would probably appreciate the space more than she would. 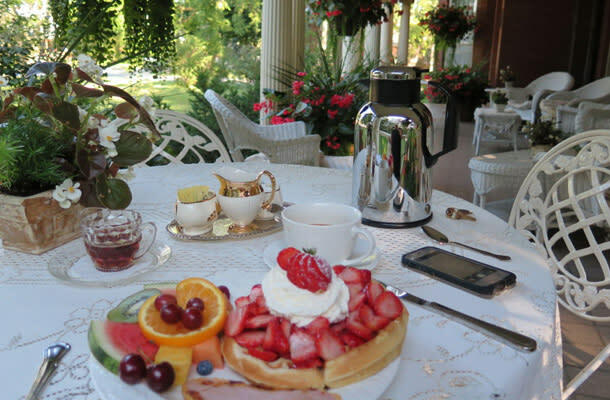 Breakfast on the porch at The Lalor Estate Inn in Dunnville is a huge treat. Swank insisted Brough join she and her friends on the porch, where they were having a drink, and asked if she was coming to the set to see the movie being filmed. Brough replied she didn’t have access. But Swank said she’d send her driver. The next day Brough went to the set. Later I’m told Richard Gere also was in the movie and stayed at a different property, where the owner came down at breakfast and asked if he could fix a wonky alarm clock. After a great night’s sleep, I get up the next morning and get a half hour to pretend the front porch is mine. Sitting among truly massive pinky-red begonias hanging from enormous baskets, I dine on waffles with whipped cream and local strawberries and dive into back bacon and sip a nice cup of coffee. I admire the beautiful garden out front and the old, sprawling trees on a perfect southwestern Ontario summer morning. 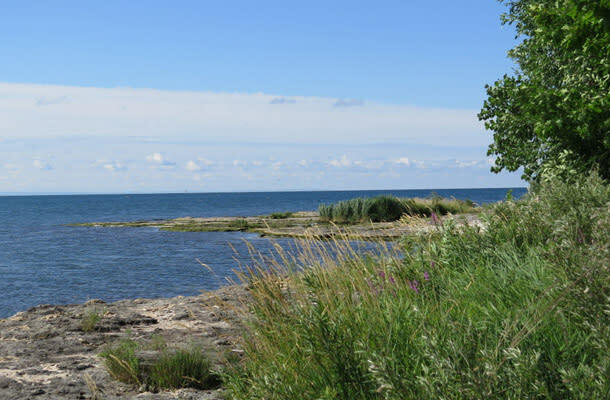 Rock Point Provincial Park is a great spot for a day at the beach or for a camping holiday. The best spots go early, so make your reservation well in advance. My last stop is at Rock Point Provincial Park, where volunteers are capturing small birds so they can band them and check their flights and monitor their patterns. I also check out the camping areas and the natural gas bbq’s they have down near the water. We wander through a small forest and stop to admire ancient fossils buried in the rock on the lake shore; some as old as 385 million years. It’s a gorgeous spot and one I’d love to see again. Come to think of it, that pretty much stands for everything I’ve seen on this trip. Click here to view more images from the trip and to read about more adventures from Jim Byers.